Celebrate the precious moments with our Pineapple Treat Hamper. 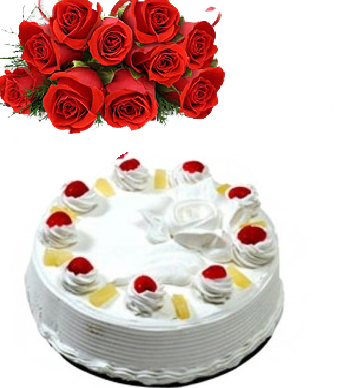 Our Pineapple Treat hamper has a one kg pineapple cake and a bunch of lovely red roses. Our florist has made an impressive arrangement of the 12 blooming red roses which are surrounded by green leaves. 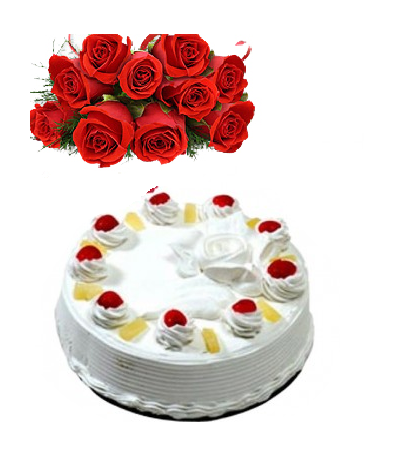 The fresh sweet pineapple cake will surely delight your dear ones. Red roses double the joy of any event and make everyday a memorable one, send roses bouquet online to show your love and appreciation. The Pineapple Treat is a lovely way to tell someone how special they are. Ideal for birthdays, weddings, anniversaries, Valentine’s Day etc, Pineapple Treat suits all occasions.Send flowers and avail our home delivery and same day delivery service.